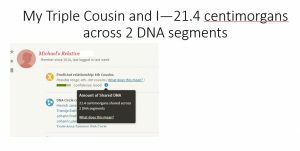 This session assumes listeners/attendees have a basic understanding of what AncestryDNA offers, how to navigate their AncestryDNA matches, how to track working with their matches, what shared matches are and are not, and have already done some work with with their AncestryDNA matches–at least having worked through their first/second cousins matches at least once to determine connections where possible. If you have not yet played with your matches, this session is not for you. The basics of the system are not covered in this session. This is a session focused on research methodology and more advanced working through the matches. In this session we will work through several extended examples based on Michael’s own research. 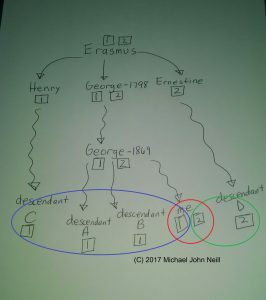 This will include a relatively straightforward example, families that have multiple relationships, and families from areas where “they’ve lived there for hundreds of years” and the shared relationships are distant and unknown. The importance of sifting out (where possible) and tracking will be emphasized. Our focus is on process and analysis–not in making you a geneticist. Can’t attend live? Purchase an immediate download of this presentation for $16. This hour-long presentation will present a brief overview of what autosomal DNA results are and are not. 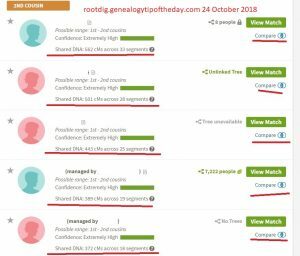 These are the tests that are done at AncestryDNA, MyHeritage, FamilyTreeDNA, and 23andMe. Effective use of your results is easiest to do if pre-planning is done beforehand. This presentation will also help those who have not really delved into their results or feel they need to regroup their analytical process. Discussion will include determining what problems your results can potentially answer, goal-setting, preparing for sifting through your results, generalized sifting strategies, locating as many ancestral descendants as possible, reasons why you have to work on the people who aren’t your problem people, and more as time allows. Register for live attendance on Monday 19 March 2018 at 8:00 pm central–space is limited. Can’t attend live? Order now for immediate download.